THE STORY - A darkness swirls at the center of a world-renowned dance company, one that will engulf the troupe's artistic director, an ambitious young dancer and a grieving psychotherapist. Some will succumb to the nightmare -- others will finally wake up. THE GOOD - Haunting imagery and unforgettable cinematic moments makes Luca Guadagnino's 2018 remake of "Suspiria" feel distinct from its 1977 original. Disgusting makeup effects, a gorgeous score by Thom Yorke and precise (if a little manic) editing and sound work. THE BAD - With light characterization and plot, there's no reason why this moody piece needed to be two and a half hours long. It's the "mother!" of 2018, so it is sure to divide audiences no matter what. ​​​Upon leaving the theater, I was not entirely sure if Luca Guadagnino’s remake of “Suspiria” was the best or worst movie I had seen all year. I wasn’t sure if it featured the best or worst editing. The best or worst performances and characters. Or even the best or worst story of 2018. All I knew was that the film had cast a spell on me because A. This is a positive review and B. I can’t stop thinking about it and how badly I want to see it again. Despite a tremendous amount of flaws, “Suspiria” bewitched me and that is the best compliment I can pay this unholy 2018 remake. Told in six acts and an epilogue, in 1977's Berlin, "Suspiria" tells the story of a young girl from Ohio named Susie (Dakota Johnson) who has traveled across the world to be a part of the world renonwned Helena Markos Dance Company. Taking place during the chaos caused by the Red Army Faction called the "German Autumn," Susie enters the dance company under the watchful eye of Madame Blanc (Tilda Swinton) and quickly makes a strong first impression, putting herself in the lead of their upcoming dance piece titled "Volk." Elsewhere, an aging, widowed psychiatrist named Dr. Jozef Klemperer (Played by first-timer Lutz Ebersdorf...who we all know is really Tilda Swinton under heavy amounts of makeup), receives a visit from a patient who is fleeing the dance company (Chloe Grace Moretz), under great distress, putting the doctor on a path to investigate the dance company's strange activities. Convinced that there is something foul afoot, the dance company turns out to be run by a group of witches who have plans in store for Susie. 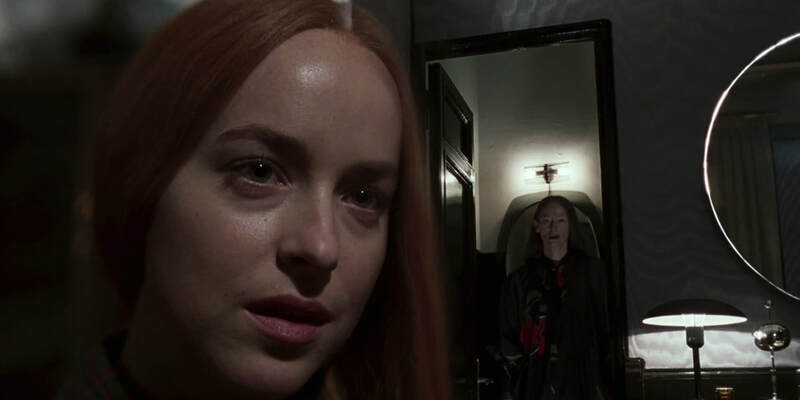 Guadagnino’s version of “Suspiria” is entirely his own. Breaking away from the original film’s story and forging its own path, Guadagnino continues to show us his versatility and range as a filmmaker. Eloquently borrowing stylistic flourishes from the 1970’s era of filmmaking, while adding in enough of his own from touches from his previous work, “Suspiria” feels raw, dangerous, and unlike anything you’ve ever seen before. Think of it though as if Stanley Kubrick, David Lynch, Ingmar Bergman, and Andrei Tarkovsky all decided to make a film together and you might get something that closely resembles this demon of a film spawned from the mind of Luca Guadagnino. This is not a film you sit and enjoy as much as it is a film you sit and get lost in. And isn’t that exactly what Guadagnino has given us in the past with films such as “I Am Love," "A Bigger Splash" and “Call Me By Your Name?” Trading the beautiful for the grotesque while still finding that beauty in the despicable wickedness that are the images from “Suspiria” is no easy feat. Yet Guadagnino makes us feel something ethereal. Something dark…something unshakeable. However, as stated above, I can’t heap a ton of praise on “Suspiria” because it is clear that the movie has its issues, cult classic status or not. The editing, while amazing in the scenes themselves as it cuts from one shot to the next in a frantic style that would give “Moulin Rouge!” a run for its money, is not perfect. Why? Because I honestly cannot find any reason to explain why this film had to be two and a half hours long. Shots could’ve easily been dropped, certain sequences trimmed down and yet, we are left with what I presume is the director’s cut version of the film and it’s honestly overwhelming to sit through. The story also still doesn’t make all that much sense to me (especially in the third act) but I’m sure numerous re-watches will help to fix that. The acting is also tough to judge because the characters are not written as fully fleshed out people but more so as archetypes. “Suspiria” is all about mood and Guadagnino achieves it in the spades with the before mentioned editing, the desaturated and gloomy cinematography, disgusting yet detailed makeup, and a hauntingly gorgeous score (and songs) by Radiohead’s Thom Yorke. It will surely divide audiences and may even upset fans who hold the original film so dear to their hearts. However, Guadagnino's vision and confidence have put this remake of "Suspiria" on its own path towards becoming a classic of its own. 2018 has finally found its "mother!" and her name is mother "Suspiria." Dance and rejoice, and while you're at it, say a prayer for your soul as well.